At the start of May we were invited on a weekend trip to the Mornington Peninsula to discover some of the region's gastronomic delights, as guests of Mornington Peninsula Tourism. I actually visit the Peninsula quite often, but mainly to go to the beaches and the fabulous hot springs, so I greatly appreciated the opportunity to explore the region from a different perspective. And as you can see from the next couple of photos, it certainly wasn't beach weather! 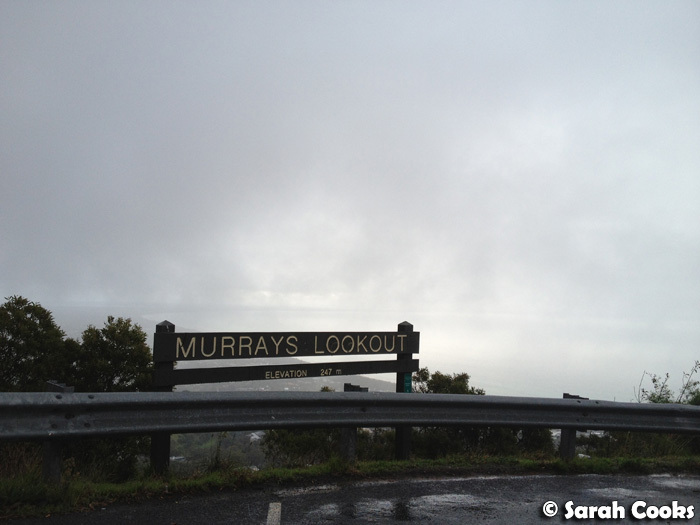 Here's the "lookout" point from Arthurs Seat - couldn't see a thing, hehehe! So it was really rainy and gloomy, but that didn't stop us from having a great time! It certainly didn't stop us from eating - with a very full itinerary created by Patty at Q Strategies, it felt like we squished a month's worth of food into two short days! 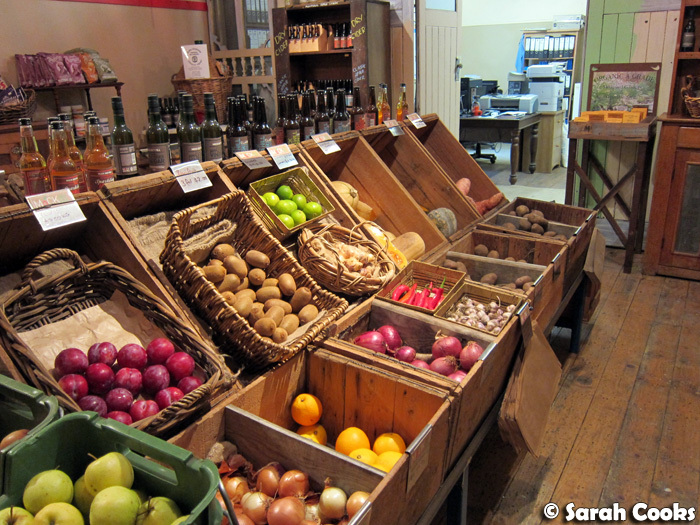 For today's post, I'd like to share with you some of the markets and food stores we visited. First stop, bright and early at nine o'clock on Saturday morning, was the Red Hill Community Market. The market is absolutely huge, with over 300 stalls, and we were lucky enough to have Katherine Cooper from Mornington Peninsula Tourism as our personal guide to show us around the market and introduce us to some of the stallholders. 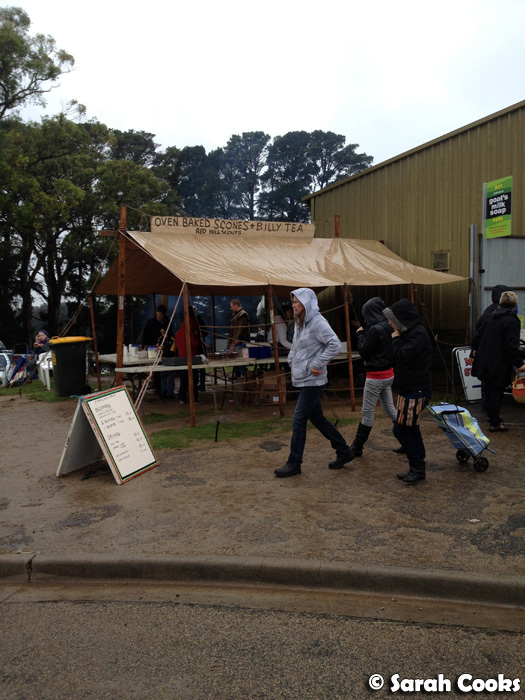 Together we braved the rain and mud and covered a good selection of the market! I loved seeing the different heirloom varieties of fruit and vegetables at Peninsula Fresh Organics - orange beetroots, purple kohlrabi, purple carrots and lovely radishes, in different shades of red and pink. 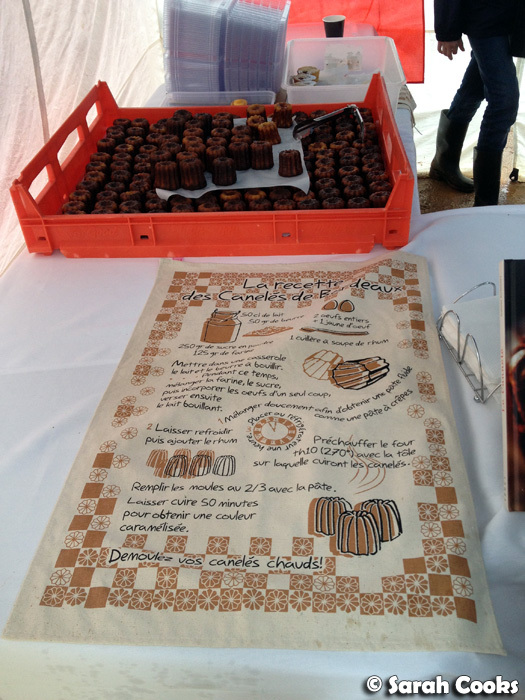 The canelé stall - I'd never seen so many canelés at once! 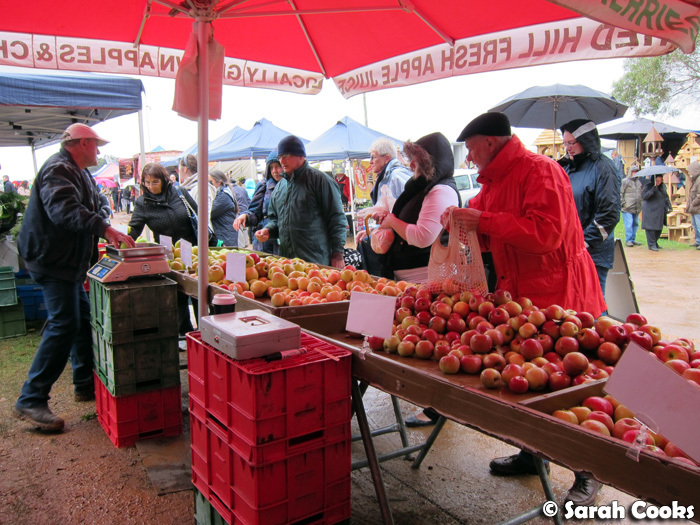 There were loads of great apples at the DelGrosso stall - we purchased heaps of Jonagolds, as well as a few litres of juice. Drum Drum Farm is actually owned by Katherine's parents, and they produce and sell a range of blueberry products, like jams, muffins, sauces and the like. 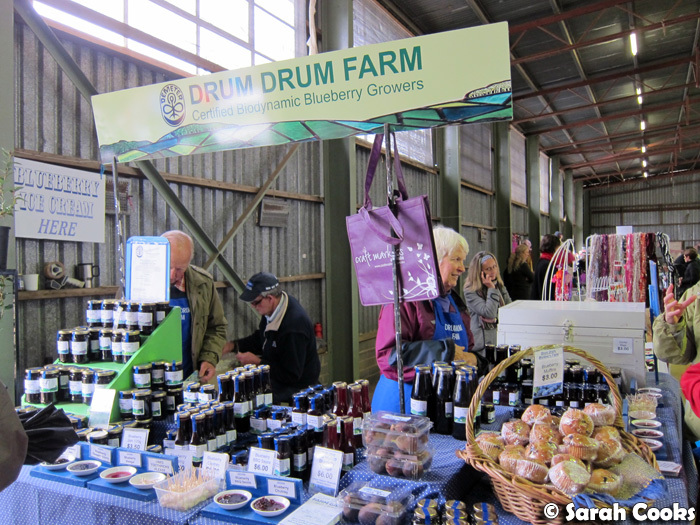 I liked their jam, and would love to pop back in summer to try their biodynamic blueberries - I'm told they can grow to three times the size of standard supermarket blueberries, with loads more flavour! 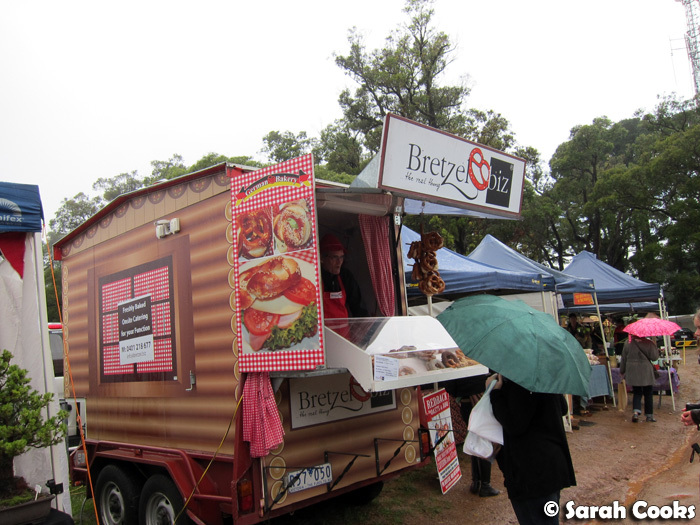 We didn't have time to stop here, but I just had to snap a pic for y'all - I don't think I've ever been to a market without a Bretzel Biz stand! Wouldn't a hot cup of tea and a scone be just perfect on a rainy morning? 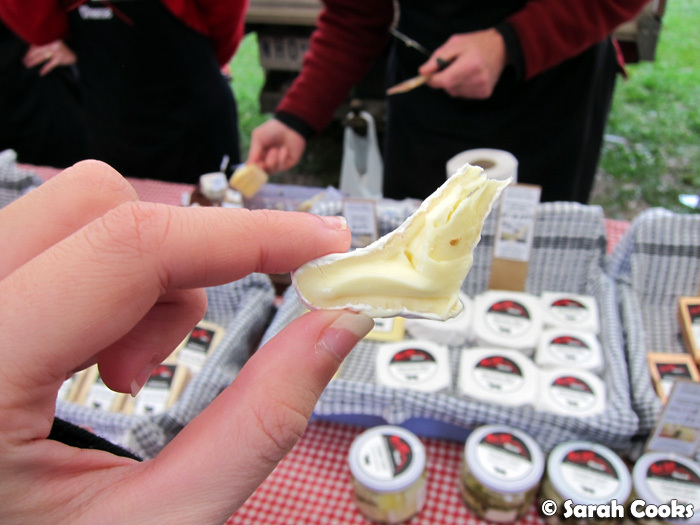 I really enjoyed the Red Hill Cheese stand, where we stopped for a tasting and a chat with the owners. Due to time constraints, we only managed to try a couple of their cheeses, but I can highly, highly recommend the Merrick's Mist - a white-rind cheese made from organic cow's milk. It's absolutely gorgeous! My favourite stall of them all, however, had to be Elfred's of the Peninsula. Elfred is a classically trained chef from the UK, who has been living and working on the Mornington Peninsula for the last eighteen years. Together with partner Michele, they produce jams, chutneys, salsas, sauces, preserves and pickles, based primarily on local ingredients. They're both really friendly and lovely! 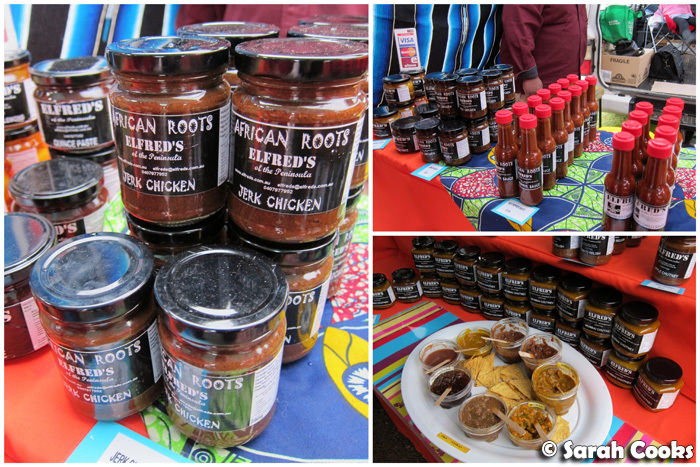 Being a chilli fiend, I loved their "Really Hot Relish" and other chilli sauces, and I couldn't leave without buying a jar of jerk chicken marinade. I knew we were all on the same foodie page when they said: "I know the jar says 'jerk chicken', but this is actually really good on belly pork". I can't wait to try it out! 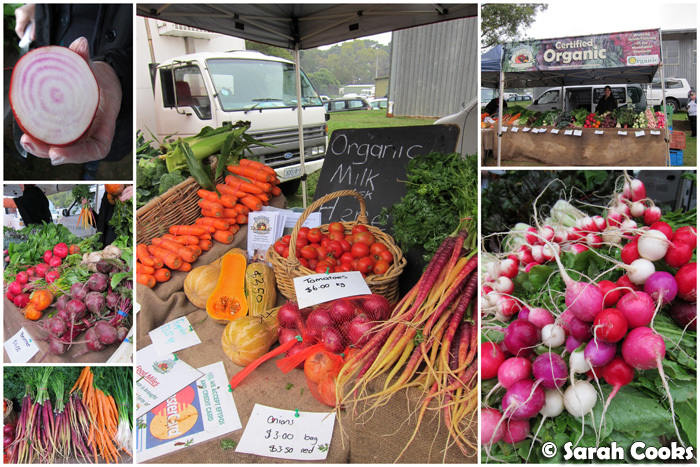 The Red Hill Community market runs the first Saturday of the month (September to May) between 8am and 1pm. So yup, that means the timing of our trip was just perfect and we managed to visit the market before the winter break! The next one will be held on the 1st of September, and is well worth the early-morning drive to visit. Mock Red Hill was a "suggested visit" on our itinerary, and I'm glad we dropped in! They're a biodynamic apple orchard and processing facility, with a retail outlet. 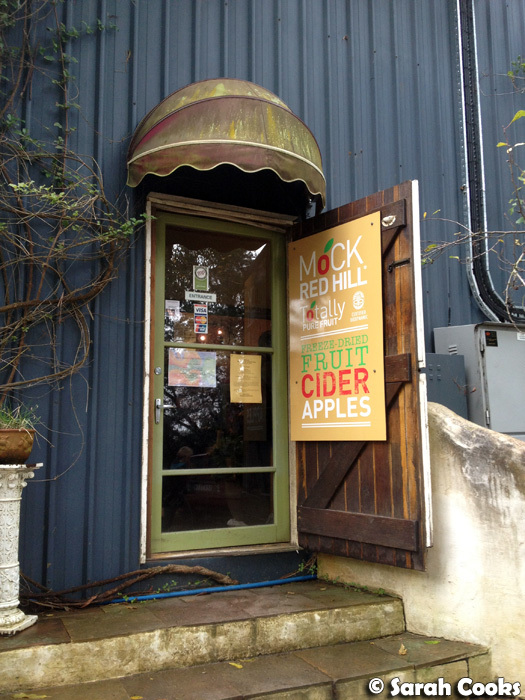 The shop is kinda like a cellar door / health food store, selling fresh fruit and vegetables, grocery items, and Mock's range of apple ciders and juices. 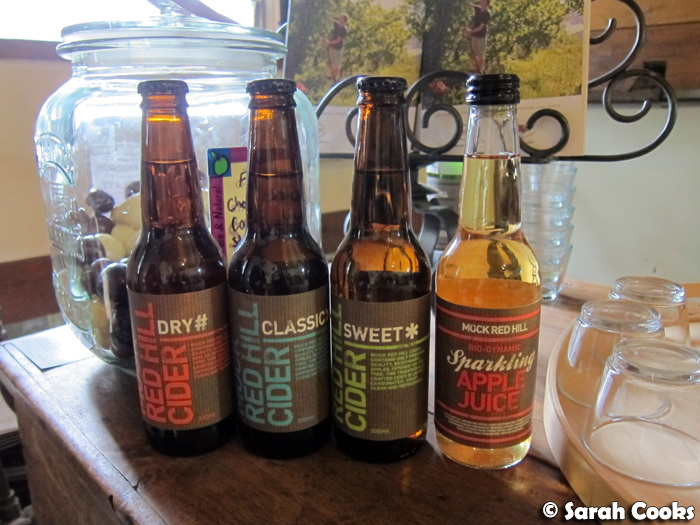 We did a guided tasting of their ciders - I found the dry one a little too aggressively dry for me, but enjoyed their classic and sweet varieties. I really loved their sparkling apple juice - it had a lovely creamy taste, and we ended up buying a six-pack mix of the ciders and sparkling juice to take home. 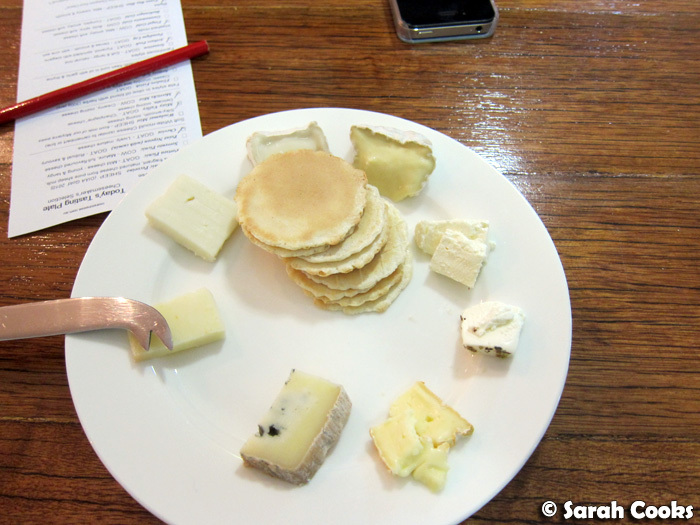 Red Hill Cheese wasn't on our itinerary, but after trying their gorgeous cheeses at the market that morning, we just had to squeeze in a visit! 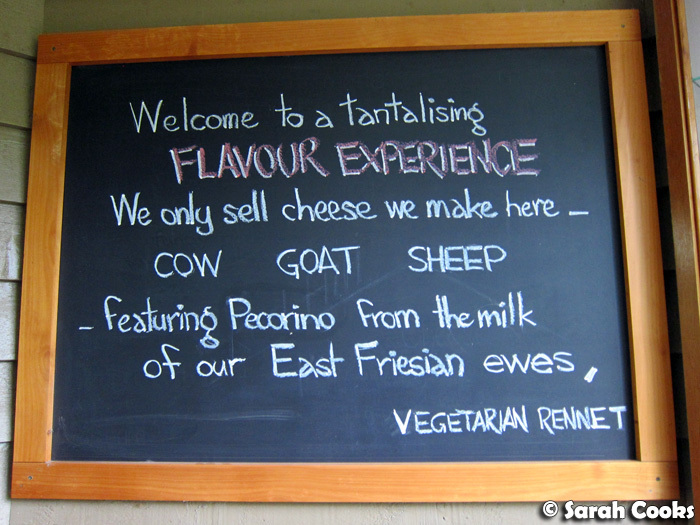 They're a small cheesery, producing cow, goat and sheep's milk cheeses using vegetarian rennet. The offering here is simple: a tasting plate of eight cheeses is $5 for two people or $10 for four, representing a variety of different styles. I was extremely impressed with the quality of the cheeses, and we bought a Merricks Mist (a soft, white mould cow's milk cheese) and a Prom Picnic Pecorino (a sheep's milk cheese) to bring home. 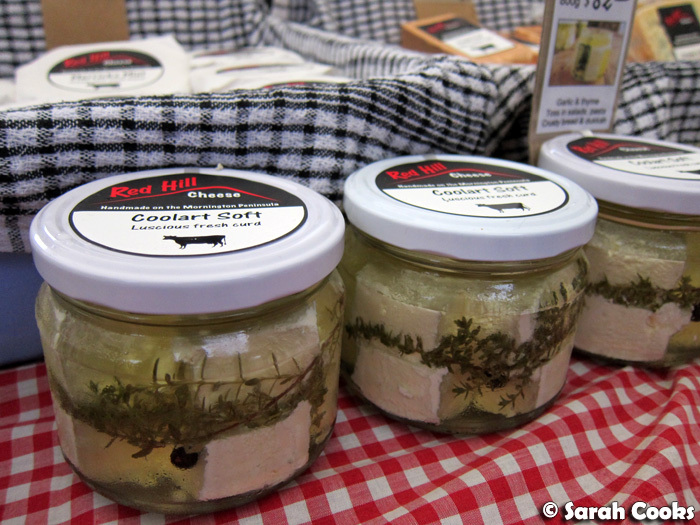 I think Red Hill Cheese is the best dairy in the region, and well worth a visit. They actually conduct cheesemaking classes too, which sound like a lot of fun - I'd love to go back and try one out one day! 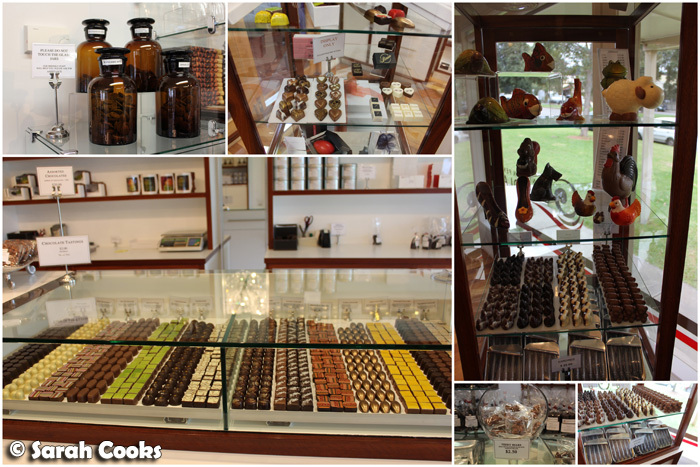 Last, but not least, is Mornington Peninsula Chocolates, located in the town of Flinders. Isilda Caldwell and Milton Laycock were inspired to open a chocolate shop after watching the film Chocolat. Now, I'm sure many people had the very same idea after seeing that film, but Isilda and Milton took that dream, and through hard work and dedication, actually turned it into a successful business! Respect. At the moment it's just a retail shop, but works are in progress to open a little chocolate cafe next door. They make a variety of individual pralines, in a wide range of flavours. We were given a little sampler to taste, and I particularly liked the lime ganache, with its very strong, very pure lime flavour. In fact, I found that the pralines as a whole had very clear and distinct flavours. Whilst I thought they were all of very high quality, I'd particularly recommend trying the more unusual flavours, like the citrus ones, chilli, cinnamon and so on. Now, whilst the pralines were very nice, I was actually most excited by the gorgeous chocolate animals they produce. (In the top right hand corner of the above photo, you can see a sheep, some turtles, a frog, some roosters...) When I saw them, my first thought was: "Wow, those would be perfect for Chinese New Year! ", and when I had a closer look at the price list, I saw that they actually make a rat too! (I was born in the year of the rat, you see). There weren't any rats in the cabinet, but Milton kindly went out the back to get one to show me! WOW! How cute is this guy!?!?! I was thinking of coming back next year to buy one for Chinese New Year, but you know what? After my oohing and aahing over the choccy rat, Sandra secretly ordered one the week after we got home and had it delivered to Melbourne! Yay! The one we got delivered looks just like the one above, but not quite as shiny - he must have gotten a little scratched in transit. I don't really have the heart to eat him because he is too cute! 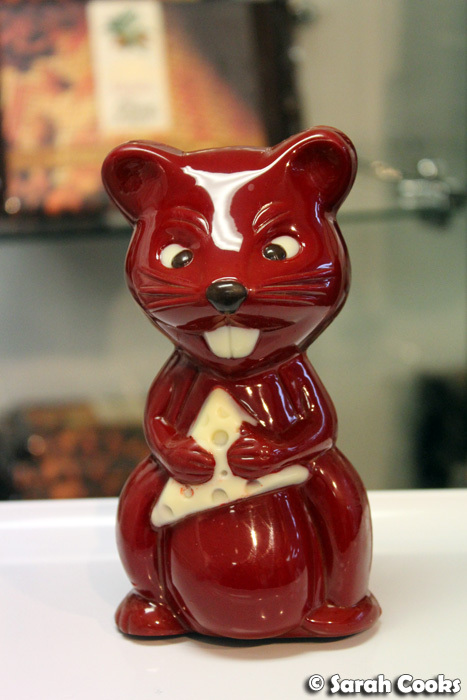 I've named him Leicester because he's red and he likes cheese - get it? Sarah and Sandra visited the Mornington Peninsula as guests of Mornington Peninsula Tourism. 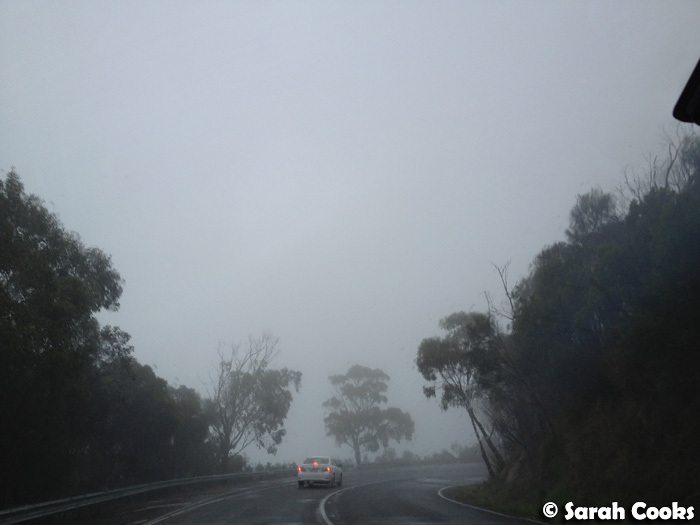 This is the first post from my 2012 Mornington Peninsula Trip series. Gosh i hate such weather! totally ruins everything! I love that you named the rat Leicester!! Lorraine - I absolutely agree! Alaina - Yup, totally! We also ate him over the weekend. A sad, yet delicious, moment.